I came home from work the other night just beat. I mean, I’d had meeting after meeting, and a big deadline. Of course, I felt like I had a ton of bricks weighing me down. Just all that stress. But the hubby had a great idea…an old recipe I used to make when the kids were little. 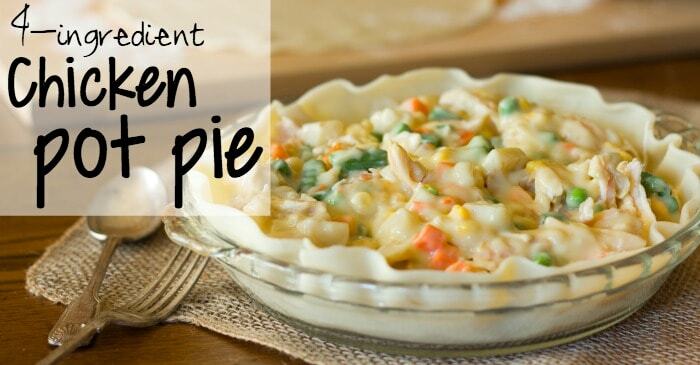 4-Ingredient Simple Chicken Pot Pie. Yeah, less than 30 minutes and only 4-ingredients. This easy chicken pot pie is so good, so rich. I just smiled. He’s brilliant, my husband. Well, and maybe I’m a little brilliant, too for making this awesome dish! LOL! 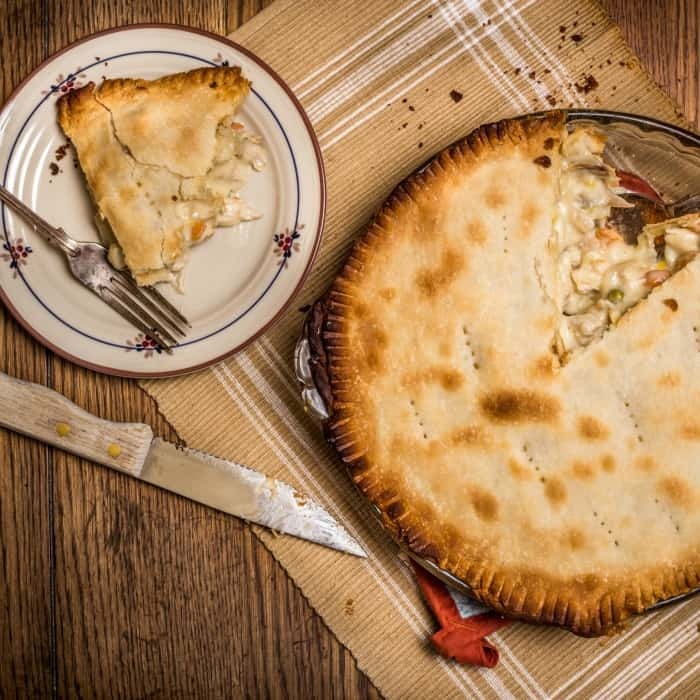 This simple chicken pot pie is like a tiny, fluffy hug on a cold night. I mean, who doesn’t want that? I want that. Like anytime I come home from work. LOL! So, yeah, I whipped this together and popped it in the oven. While it baked, I took off my shoes and got comfy. I mean, full-on, I put on my comfiest yoga pants, an old sweatshirt and a fluffy pair of socks. I was in my warm-and-snuggly-zone. It was like this whole relax-fest. I loved it. By the time the alarm went off on the oven–I had already forgotten all that stress. Just melted away with the warm and happy smells coming from the kitchen. I pulled out an old recipe I used to make when the kids were little. 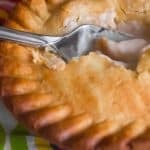 4-Ingredient Simple Chicken Pot Pie. Yeah, less than 30 minutes and only 4-ingredients. So good. And easy. 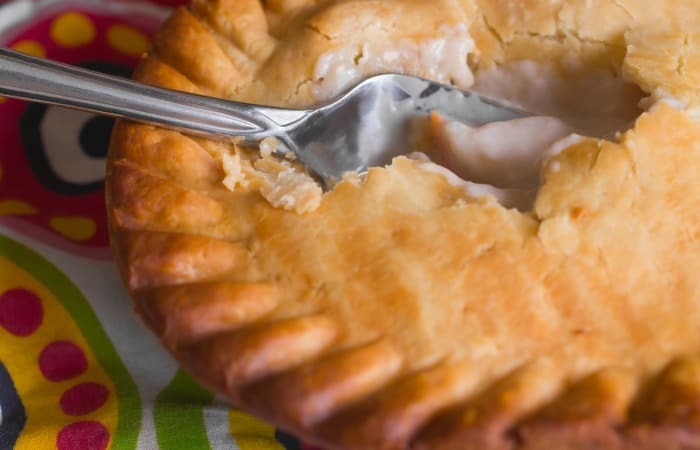 Place one pie crust in a pie pan, set aside. In a medium-sized mixing bowl, combine the Canned Chicken, Mixed Vegetables (including the liquids in the cans), and Cream of Mushroom Soup, stir. Heat the chicken, vegetables, and soup mixture in the microwave for 2 minutes. Carefully pour the heated chicken, vegetable, and soup mixture into the pie crust in the pie pan. Place the second pie crust on top of the pie pan, and trim. Using a dinner fork, crimp together the top and bottom crusts, then poke holes in the top crust. Place on cookie sheet and bake for 20 to 25 minutes, or until crust begins to turn golden brown. So, my stress therapy? Yep. Simple Chicken Pot Pie. I’ve got to remember this for any future stress-ey day! What do you do to relieve stress? Hit me up with a comment and be sure to like us on Facebook!